NLP and hypnosis training is important, of course, if you want to work in the field. And they’re both useful for training in persuasion, peak performance, and a ton of other things. But to me, that’s not the big benefit. That’s more subtle. Years ago, my mom was in the hospital, having a spot in her lungs checked out (it turned out fine). They had to go in, though. She spent some time there, and I hung out with her and talked quite a bit while she was recovering. We talked a lot about what it was like for her to grow up, where I wanted to go in life, and lots of random stuff. “What turned you from the angry young man you were, to the man you are today?” And you know what? I hadn’t thought of it in years, but when I was younger, I was an angry young man. Until she asked me that question, I hadn’t realized the magnitude of the change I’d been through. I thought for a few moments and then told her. In the mid-eighties, I picked up an NLP book and was quickly hooked. I read more, attended a national NLP conference in 1990 (I think), and took my first NLP practitioner training in 1993, and went from there. Since then, I’ve taken in all sorts of NLP and hypnosis training, and conducted dozens. I now have thousands of hours at the front of a classroom. And all that has been great. I loved seeing clients and I love teaching NLP and hypnosis. But the thing that changed me was the result of me integrating some of the key points of NLP and hypnosis. The biggest benefits (and I make my living this way), have been personal, not professional. Here are some examples of some of the most important things that shifted for me, and why I think they’re important. Locus of control is simply where you think the power in any situation resides. If you think you control the things you can’t control, it’s called being delusional — and you waste a lot of time. So, if you think you can materialize a pile of money, by thinking about it, you’re sunk. On the other hand, the more typical problem is not thinking you can control things that are within your control. I’ve seen person after person who thinks they can’t lose weight or stop smoking because of one reason or another. Of course you can! It’s absolutely within your power. But if you believe you can’t, you won’t even try! Maybe, where I’m stuck, it’s because I have a negative belief! And as soon as I fix that, voila! The locus of control shifts to me. And then I know I can do something about it. NLP and hypnosis are (the way I practice them), very outcome focused. So many people are focused on what’s wrong, and what stops them. So many are focused on the past, or gaining insight into their problems. All of those things may require attention now and then. But focusing on what you want to accomplish is far, far more effective, in general. Imagine you’re in a room, and you can hear someone come into the next room over. For a moment, you think it sounds like a long-lost friend you haven’t seen in years. How do you feel? Then, you realize it might be someone you don’t like very well. How does that feel? What this experiment reveals is that your thoughts can create your feelings. And your thoughts may have very little to do with the reality of the situation. It turns out, it was a racoon in the next room. Let’s suppose you go out into the next room, and there’s a fresh pot of coffee. You’d like some, but there’s a sign on it that says, “Do not drink.” How do you feel? Then someone comes into the room and tells you that, they made the coffee just for Dave, whose been sick in the hospital. He’ll be here in a few minutes, and this is his favorite coffee. How do you feel now? Now, these are all situations that are being reframed from the outside. But remember, you can change the meaning of any situation, internally, by your own interpretation of the facts. I had a friend over when I was a kid. We were both having cereal and we only had one of the big spoons I liked. I gave it to him, as he was my guest. He said, “Why did you give me the big spoon? Are you saying I have a big mouth?” It meant one thing in my head, and a completely different thing, in his. They were both made up. And they both created feelings. This is an incredibly freeing concept. Each event can be interpreted in lots of different ways. And NLPers and hypnotherapists, we help people interpret events in ways that help people reach their goals. We might help them reprocess a past trauma, and see it as a source of strength. We help them see the hour a day they spend smoking as 5% of their day. They are smoke-free 95% of the time, already. They just need a little help with the last 5%. 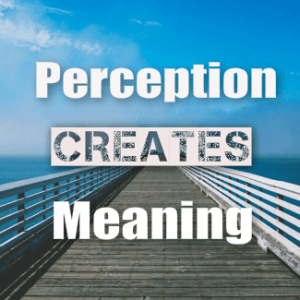 After you help enough people change perspectives and change the meaning they give to events, you begin to wonder if it’s all perspective and no inherent meaning. The conclusion I’ve come to is, that’s the case. We create our own meanings. Most people don’t like that interpretation, but to me it’s freeing. We imbue events with meaning. And therefore, we have the ability to create any meaning for any event that we want. And that can help deal with what people call tragedy, disappointment and defeat. PS: How has learning NLP and/or hypnosis changed you? Let me know in the comments section, below.